2015.03.27 : The renovation is complete. The reservation is going to start from Apr. New Oriental Hotel Myeong-dong is renovated on April 2015. The room is more comfortable and stylish. 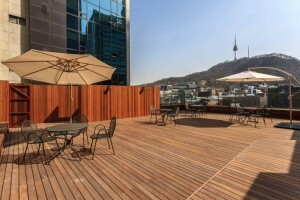 The hotel is best location just 1 ~3 min walk to Myeongdong, Namdaemun Market. The surrounding is very convenient becuase there are a lot of restaurants and convenient because of there are lots of restaurants and conveniece store. New Oriental Hotel Myeong-dong Hotel has rooftop with a view of Namsan N Seoul Tower. You cna relax with comfortable seats.